Thesis document finished and delivered! João Silva, Diogo Cabral, Carla Fernandes, and Nuno Correia. 2012. Real-time annotation of video objects on tablet computers. In Proceedings of the 11th International Conference on Mobile and Ubiquitous Multimedia (MUM ’12). ACM, New York, NY, USA, , Article 19 , 9 pages. The full paper “Real-Time Annotation of Video Objects on Tablet Computers” by Silva, J. F., Cabral, D., Fernandes, C., and Correia, N was accepted and will be presented at MUM2012! 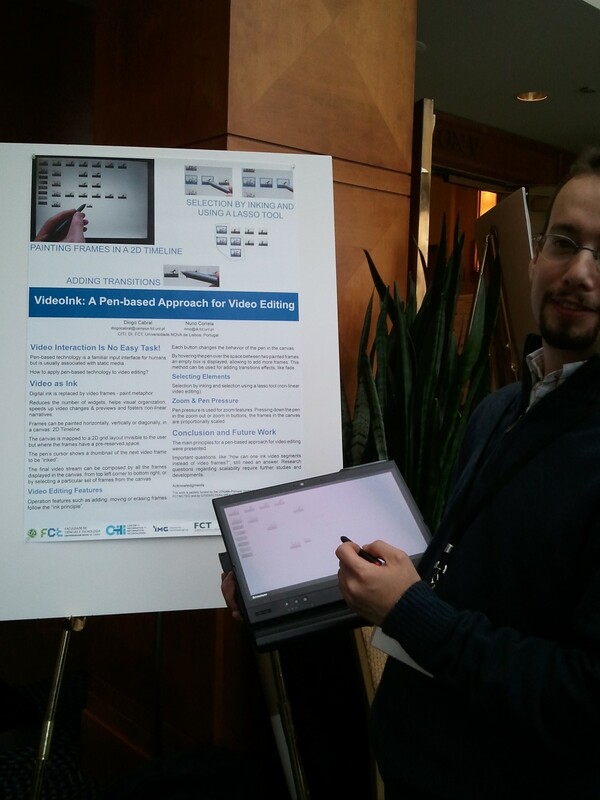 Cabral, D. and Correia, N. VideoInk: A Pen-based Approach for Video Editing. In Adjunct proceedings of the 25th annual ACM symposium on User interface software and technology (UIST Adjunct Proceedings’12 ), ACM, 2012, pp. 67-68.